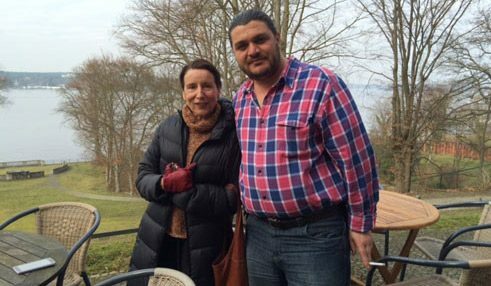 At the beginning of 2016 the 1976-born Syrian writer Assaf Alassaf received the “White Sea Grant” for threatened writers and artists from the Mediterranean region, awarded by the Allianz Cultural Foundation in cooperation with the Berlin Literary Colloquium (LCB) and the Akademie Schloss Solitude. Since then, Barbara Burckhardt met him during his residence-stay in the LCB at Wannsee in Berlin and conducted this interview with him. Assaf Alassaf, between November 2014 and February 2015, you posted over a hundred entries on Facebook, which later appeared as an e-book entitled "Abu Jürgen: a grotesque fantasy" about how you can snag a “delicious German visa” from the fictional German ambassador Abu Jürgen so as to come to this country. How did you get this idea? When in the autumn of 2014 the great migration of refugees began, many of my friends left Lebanon, where I was living then. They went to Turkey, to Europe, by the most various routes, with the help of expensive smugglers, some with visas … I too had the feeling that for us Syrians Lebanon can be only a staging post. I asked myself what I would do after two years in Lebanon. I didn’t have the money to pay a smuggler; I have a wife and two daughters, three and five-years-old. I then began to write this fictional story on Facebook. I also wanted to get out, but didn’t know how. The story was a kind of substitute act. A joke. I didn’t have a plan. But now, a year later, we’re sitting here in the luxurious surroundings of the Berlin Literary Colloquium. What happened, quite without plan? The story begins even earlier. In 2011 I left Syria because of the war and because I had a few problems with the government and was threatened with arrest. I went to Mauritania and worked there as a dentist. Then I travelled to Beirut, only for a few days really, to meet my family there; I couldn’t go to Syria, where they still lived. I had a return ticket, but in a crazy moment I spontaneously decided to stay in Lebanon with my wife and my children. Everything I possessed was in Mauritania, but luckily I had my papers with me. In 2014 you could, as a Syrian, still enter Lebanon easily with a passport and stay for six months. Every six months then you had to apply again. In 2015 this changed; the regulations were tightened. You had to work and live illegally. It was a situation in which you didn’t know what would happen tomorrow. But there was no possibility for me to leave the country. I have my book to thank for that. The Heinrich Böll Foundation started a programme for the translation of Arabic texts. Sandra Hetzl discovered my Internet posts on “Abu Jürgen” and translated them; they were then published as an e-book by mircotext. This led to an invitation to the Munich Kammerspiele last October for the Open Border Conference, which procured me a legal Schengen visa for three months. At the Beirut airport, however, my passport was stamped with a stamp that barred my re-entry into Lebanon. I could tell my family only by phone. When I entered Germany, I immediately applied for asylum. I had no other choice. Two days ago I just received permission for three more months; after that I hope to get a residence permit for three years. And I hope that my family can join me, which at present doesn’t seem to be becoming any easier. Why did you come to Berlin? Because the procedure is faster here. In Bavaria I was told that I’d have to wait seven or eight months until I got a residence permit. You then stayed initially at a sports hall in Berlin-Zehlendorf? Yes. The first fourteen days I lived at the place of my publisher Nikola Richter, then I moved to the camp for six weeks. The big sports hall of a high school was divided into two areas, one part for families, the other for single people like me. We were about eighty people in a single space. Compared to other camps it was relatively comfortable because there was room. No privacy, of course, not that. But I preferred being in a big hall with eighty other people than in a single small room with three or four. There were a few problems, but on the whole the situation there was pretty well under control. Did these first weeks in Germany match your expectations of the country? I wasn’t doing badly. I allowed myself to enjoy the clash of civilizations. I was a refugee first class compared to most of the others, arrived by airplane and equipped with a three-month visa. I had my friends at the Munich Kammerspiele, my publisher; they all supported me. From the Goethe-Institut I received a salary for three months; that was very privileged indeed. And the camp couldn’t really shock me; I felt reminded of my military service in Syria. And then I received this five-month grant, two months here at the Berlin Literary Colloquium and three months at Schloss Solitude in Stuttgart. In Syria, Mauritania and Lebanon you worked mainly as a dentist; now you’re a writer. Do you see your future in Europe as a doctor or as an author? In Syria, Mauritania and Lebanon, in addition to my work as a dentist, I wrote and published texts. This dual activity isn’t rare in our country. But “Writers are hungry”, we say. So I’ll try again here to gain a foothold as a dentist. This will take some time. Above all I need to learn the language. What you now have is a writer’s grant. What are you working on at present? I’m writing many smaller stories. But I don’t yet have a plan for a book. That will come, I hope, at Schloss Solitude. Do you want to write about your experiences as a refugee in Germany? What term would you prefer to use? “Refugee”: this refers chiefly to flight, to that from which you are seeking shelter, to loss. “Newcomer” includes the future, the new. Which term do you feel covers you? It’s complicated. I’m both. Five months ago I still thought that Germany is my future. I’ll stay here forever. Three months later I’ve changed my mind. Now I think more flexibly. Maybe I’ll go back after six, seven, eight years – maybe. If the war’s over. Or maybe my children, if they can come here, won’t want to leave. I don’t know. Maybe I’ll have to stay here. Or go to Turkey. Or to some other place. The decisive concept for me now is flexibility. I have to remain open and free. You’ve had some experience of chance in your life. Life without a plan can go far – that’s what your story tells us up to now. The decisive moment was when I left Syria. That turned my whole life upside down. It was like a second birth. Until then I had a small world in my head, definite rules, images, memories, plans. I could have grown old with all that. I left it all behind, this cosmos, which had been valid for me for thirty-five years. It was completely destroyed for me. But now I know that this was also an opportunity. I’ve learned to treat it optimistically. I love Syria, I loved my life there. But it was a small world. Now everything is possible; I can discover the whole world. The small world of Germany, where you’ve been living for five months – has it met your expectations? My knowledge of Germany before coming here came from books and films. After savouring the clash of civilizations, I began to look more closely. And found that the big difference exists only in our heads, in our stereotypes. We’re not so different. The Germans are friendly and outgoing; they seem to me less xenophobic than Syrians. Even in Leipzig everyone was nice to me. And before going there, all my German friends had warned me. Generalizations are no longer valid for me. Life in Germany, in Europe, isn’t so different from that in Syria. The world has changed in the last twenty years and cultures have become more and more similar. When I walk through Berlin, I see, as in Syria, primarily one thing: the great mixture. People from everywhere, black, white, yellow. I can decide how I want to live here: as a German, even if I come from Syria, or in a small, isolated community. Sure, there’ll be a few problems, but the world isn’t perfect. What I’ve learned in the recent months is that if I can suddenly live here as a writer, then I can do so anywhere. The only thing that counts for me and for my children is that the country must be safe. Paradise doesn’t exist. Not even in Germany. You have to struggle everywhere to have a future. Barbara Burckhardt conducted the interview. She is a theatre critic and editor at “Theater heute”. From 2005 to 2007, and from 2014 to 2016, she was a member of jury of the Berlin Theatre Meeting, and from 2010 to 2013 of the Mülheim Theater Festival.